Just humor me for a second and pretend that you totally got that this post's title was a play on the phrase "head honcho." No? Ok moving on. Regardless of whether or not you think I'm clever I am here to introduce you to the *best* article of clothing for fall and winter, ponchos! I recently got this grey one and am hooked. Everything about this: the color, pattern, and softness is absolutely perfect (I'll let you know how perfect it is when I try to put my backpack on to wear it to class…). 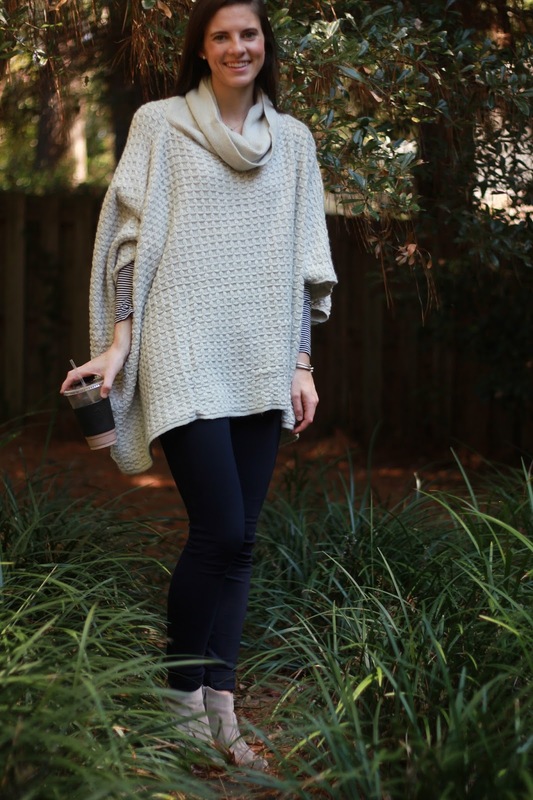 I am usually not a turtle neck kind of girl (I really don't like things touching my neck) but this one has the most flattering collar that folds into itself to create a really flattering look without feeling like it is constricting your neck! 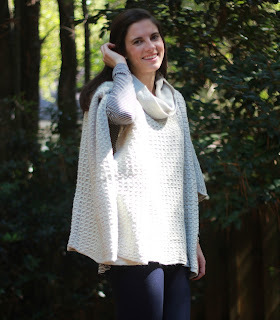 I paired the poncho with a comfy striped shirt and my favorite navy leggings of all time! Somehow it looked incredibly put together with minimal effort but the real kicker (yep, definitely think I'm funnier than I am) are these grey fringe booties! If you didn't see Monday's post then you may not know that I felt obligated to jump on the bootie trend since they look so cute on everyone I've seen wearing them. Well, at under $50 and incredibly comfortable and cute this pair is the perfect way to test out this trend. My verdict…I'm sold I think I need booties in every color but fortunately I have a bit of self control so maybe one new pair (would love this pair) would suffice! I don't do outfit posts very frequently but if y'all would like to see more of them then I can definitely start! I'd love to know what you think and if any of these pieces will be making their way to your closet soon! PS if you haven't checked out the Shopbop Friends and Family sale then go, go, go! 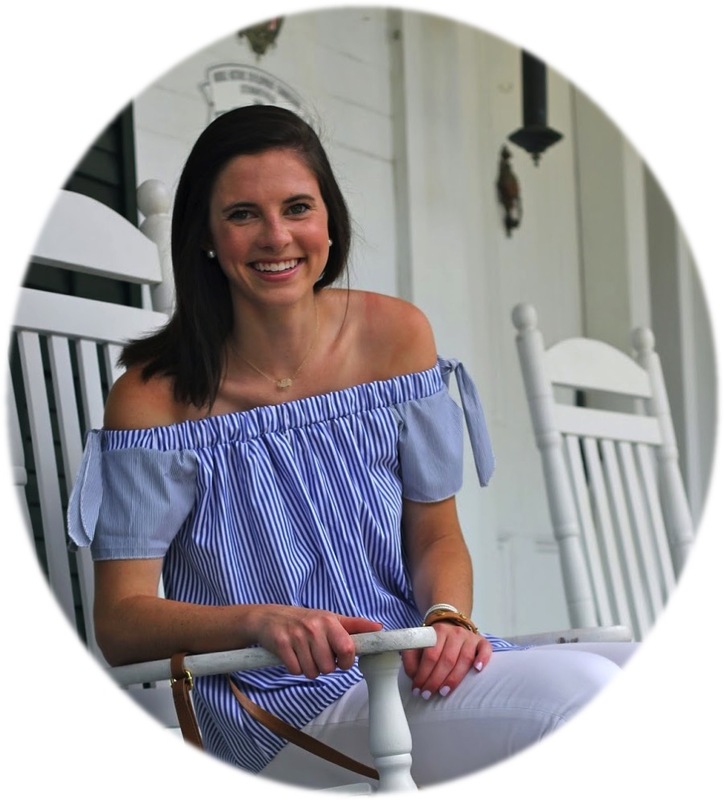 So many great pieces are 25% off with the code INTHEFAM! Best part aside from the discount? If you're an amazon prime member you'll get your goodies in the mail in 2 days!! This outfit is so cute Dorothy! Love the poncho! 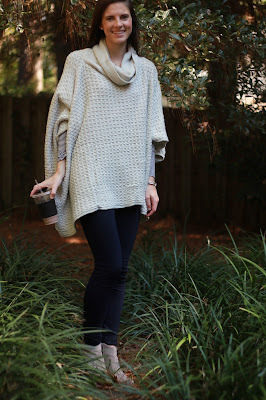 I love the poncho look this season! I'm on the hunt for one next time I go to the mall! 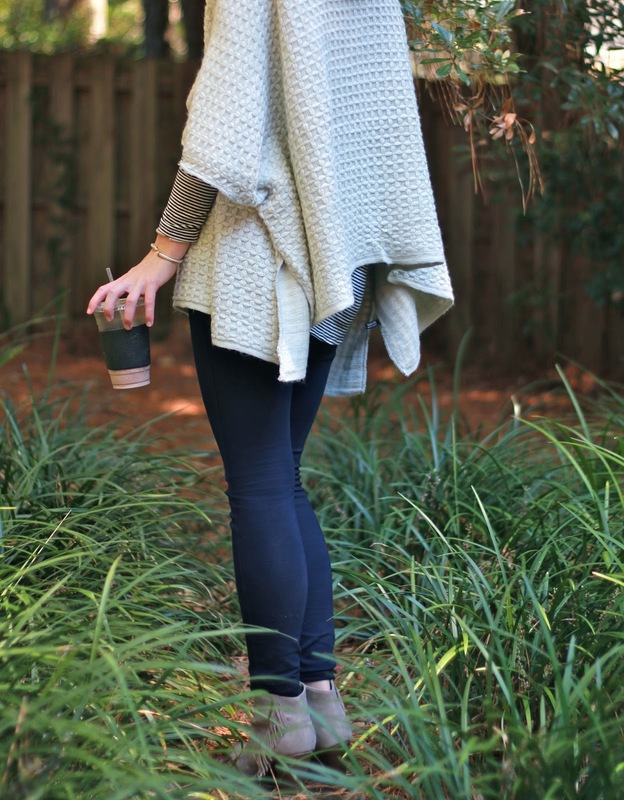 Ponchos are my favorites for the fall and I really like this one, seems so cozy and the color is perfect. Love the whole look. When is your next blog post?! We are proud to provide customers with an extensive range of distinctive, quality handbags made by topnotch materials with professional handcraft. Replica Prada Purse For Sale has got to be one of the most unique and creative bag I have seen till now. I think every fashion lover would love this bag because of its exclusive design and nice style. What sets us apart from other online stores is that we offer the most prefect products at affordable price, as well as fast shipment and courteous customer service all the time. If you want to ensure that you are always on top of the trend, choose a world-class bag that adapts with the ever-changing world of fashion by Replica Hermes Feu2Dou Bags For Sale. A simple, yet bold and luxury tote bag is great selection to transport your most essential item in style. Replica Givenchy Purse For Sale is a definite must have for us city girls. If you handbag is your life, then carry it in style with Knockoff Alexander Wang Handbags For Sale, the most reputable luxury brand all over the world. This kind of fashionable bags will never let you down.